The biggest change—among many—in iOS 6 will undoubtedly be Apple's new Maps app. And though its turn-by-turn directions, Flyover and oh so sweet Siri look promising, the real question is how Apple's maps will compare to Google's. Here's a side by side comparison of the two, so you can see for yourself. It may have you wishing Apple hadn't gone it alone quite yet. It's admittedly a little unfair to judge Apple Maps since it hasn't even passed beta yet, but it doesn't change the fact that Apple's offering has to be great to not be a failure. And it's also worth noting that Siri proved Apple's not afraid to put an incomplete feature on an iPhone. No iPhone user wanted to kill Google Maps. It makes me uneasy to even think about a phone without it. If you're replacing something as ubiquitous and functional as Google Maps, you had better be just as good. Or as a wise man from the streets once said, "If you come at the king, you best not miss." 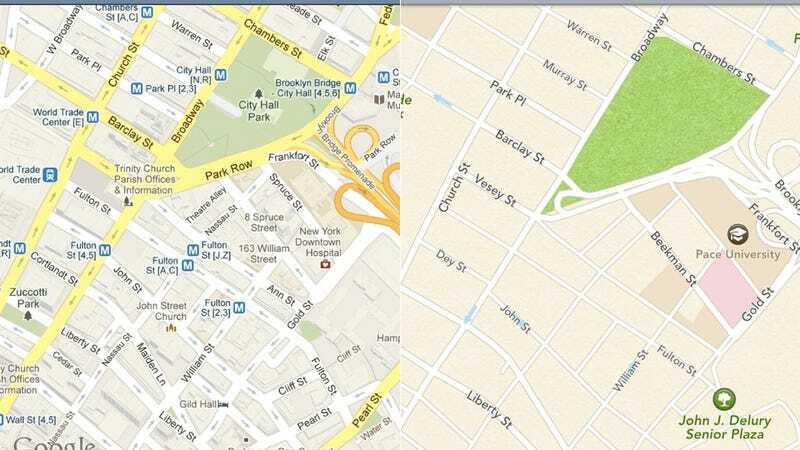 Note: In the examples below, Google Maps is on the left and Apple Maps is on the right. Apple's maps look wonderful. Crisp, clean, paper-like, even, but... right now they're completely devoid of useful information. Compare the side-by-side images of lower Manhattan (at the top of this post) and San Francisco (directly above) and it's pretty clear that Google Maps gives you more information in terms of street names, street directions, subway stops, emphasis on major streets and so on. The solution is to add more map information even when zoomed out. Pretty is great to look at; informative is better to use. Traffic on Apple Maps seems pretty majorly incomplete but this is more of a beta issue than a real-life issue, since Cupertino's going to lean heavily on users to determine where the gridlock is. Directions on both Apple and Google Maps are great; they'll get you to where you need to get to. The advantage of Apple Maps over Google Maps on iOS is that Apple will give you turn-by-turn directions, which Google never did on the iPhone (though it's been available on Android for some time). However, Apple desperately needs to add public transit directions before iOS 6 launches. Satellite view, even if you rarely use it, tells the same story. Google Maps just currently has more information at every level. There is, though, a good chance you use Street View. Apple Maps doesn't have an equivalent feature yet. And though Flyover seems really nice, it's nice in a "show off to your friends" sort of way rather than something you'd use on a regular basis. We'll see how Apple Maps really works once iOS 6 officially launches. But as of right now, it's lacking a lot of the granularity and features that make Google Maps great. So far upgrading doesn't seem like an upgrade at all.